​A factory built fireplace is a firebox, its insulating system and its chimney, made entirely of factory made parts designed to be installed without the need of site fabrication. Other common terms for "factory built fireplace": prefab fireplace, and zero clearance fireplace. These products have been on the Canadian market for more than 40 years, manufacturers have incorporated many design changes into the present generation of factory built fireplaces. These include new combustion systems, glass air wash systems, sealed ceramic glass doors, advanced refractory components and heat recovery systems. The range of choice and design in factory built fireplaces is expanding rapidly. from one unit to another is often not acceptable and can be dangerous. Only parts that have been tested and listed for use with the applicable make and model may be used. If there is ever any uncertainty, contact the manufacturer or Canadian Chimney for assistance. The most common fireplace designs display one side of the fire for viewing. 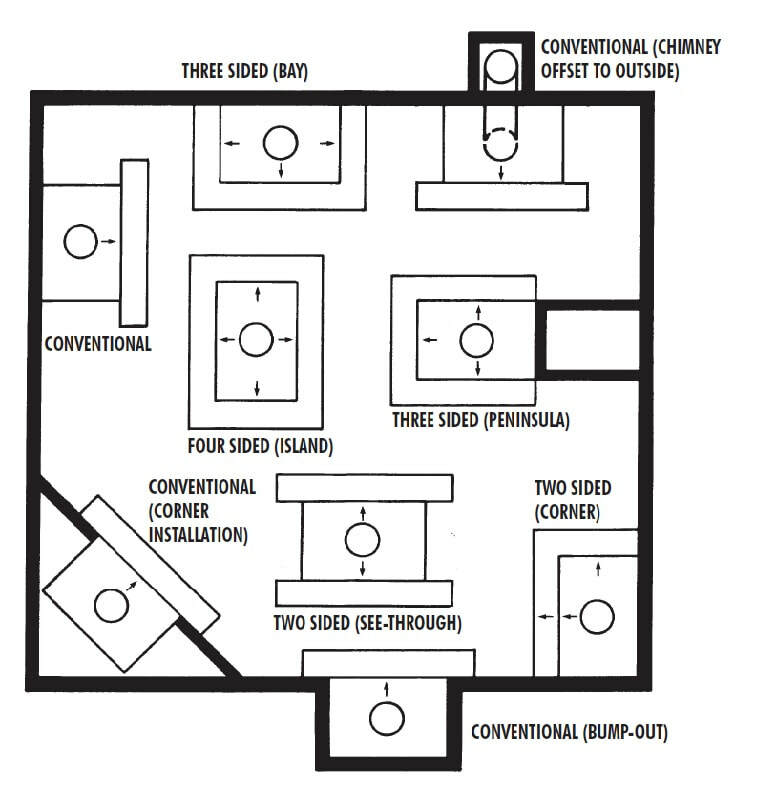 There are however fireplace models that reveal two opposite sides (transparent), two adjacent sides (corner), three sides (bay or peninsula) or four sides (island).